Well, I ache this morning in places I didn’t know I could ache. Triathlons appear to have been developed to create completely new forms of pain and exhaustion! They say swimming is hard, the mass start looks scary, and open water just gives them the heebie-jeebies. Well, I’ve got to admit, they have a point. 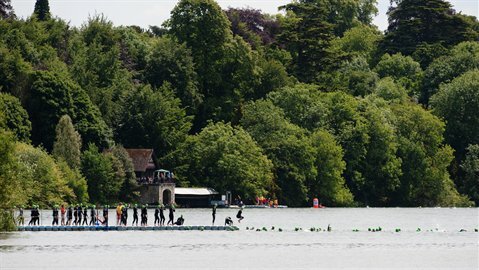 I did a teeny bit of open-water swimming in Hampstead so that I could get a feel for what swimming in cold water and wearing a wetsuit was like. But I wasn’t prepared. When it came to yesterday’s start, I got a reality check like no other when the starting hooter went off. In the first five seconds of my swim, my mind rushed with a frenetic string of thoughts: Why are these people so CLOSE to me? Where’s the black stripe on the bottom? Why can’t I see my hand in front of my face? I can’t breathe. Am I going to die? In spite of all the pool hours I had put in, nine minutes into my first real open-water swim I was gripping on to one of the patrolling lifeguard’s kayaks, gasping for air. I’m sure the spectators on the shoreline were thoroughly amused. Anyway, once I’d worked out that I wasn’t actually going to drown, that my goggles worked much better when defogged and that, in reality, I was only going to spend less than thirty minutes in the water, I almost began to enjoy myself. 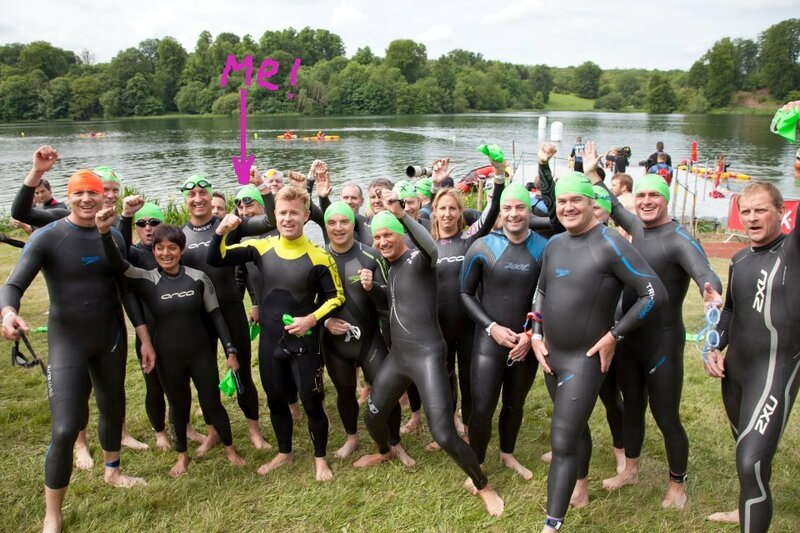 My wetsuit worked well, I got into a proper swimming rhythm and quite enjoyed spotting the number of green capped heads behind me. OK, I was only swimming breast-stroke. (It’s the only stroke I can swim.) But I made pretty good progress and even remembered to fist-pump the air as I got out. I nearly ruined everything by stumbling a bit as I tried to get vertical and horizontal sorted out, but I was soon on my way up the long hill, kindly covered by the organisers in coconut matting, into transition. I had read horror stories about this on several websites. Competitors who lost their bikes amongst the hundreds of others. People who fell to the ground in tears because they couldn’t get their wetsuits off. Demon stewards, willing you to touch your bike BEFORE putting your helmet on (and securing the strap), so they could add time penalties to your score. Actually, it wasn’t very difficult at all. 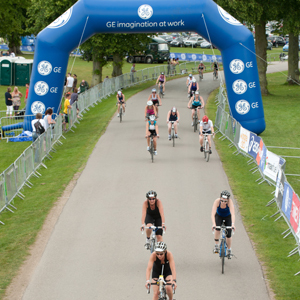 Blenheim’s transition area is superbly organised. I found my kit, remembered to sit down to remove my wetsuit and, before I knew it, was fastening on my gloves and helmet. And then, I was walking my bike to the starting line. Feeling slightly smug. My bike is not a road bike. It is a hybrid. It has road tyres on it, but it is still a hybrid. This means that its gears are not really made for tremendous speed and it is a teeny bit heavier than the slivers of metal that most triathletes call bicycles. It even has a gel saddle. Which makes it comfortable. I rather like it. I had to complete three circuits of the park to notch up the (nearly) 20km cycle ride portion of the competition. Conditions were excellent. The roads were dry; it wasn’t too hot and there were lots of people standing around to shout encouragement. By circuit three I was beginning to tire. I was also beginning to feel a bit dizzy, which suggested that I hadn’t been rehydrating as well as I would do on a long run. I stopped briefly to gulp down some fluids and felt considerably better. Before I knew it, I was coasting gently to a halt at the entrance to the Transition area and preparing to find the beautiful red towel which marked out my pitch. Bike parked? Check. Gloves and helmet off? Check. Energy gel and a bit of water gulped down? Check. It was time to face the last challenge. Now, let’s be honest. a 5k run doesn’t normally phase me. I do one about three times a week and it’s really not a difficult distance. And I’d done a few ‘brick’ sessions in training, to get used to coming off a bike and then running. But I hadn’t prepared for the true horror of trying to run after swimming AND cycling. My legs just wouldn’t do as they were told. I couldn’t get my legs to function at all for the first 2km and so found myself walking for much of the way. I was not alone! But eventually, I managed to shift from walk to jog and slowly, ever so slowly, worked my way round the two circuits that had to be endured. It really was very heavy going. Finally, the finish line beckoned and, to the applause of several team members who had finished long before me, I completed my first triathlon. I say first advisedly. I know I’m hooked. I’m already looking to do another one. If only because I have to improve the time on that run. Thank you to all of you who supported me with sponsorship. You have helped me raise about £1,600 (including offline donations) for Sport Relief, which is a wonderful figure and will do much to alleviate poverty and suffering in some of the most challenged communities in the world. This picture is of me and Kevin, the CEO of Comic Relief, proudly showing off our medals. (And, just for the record, Kevin finished after me. Not long after. But after.) 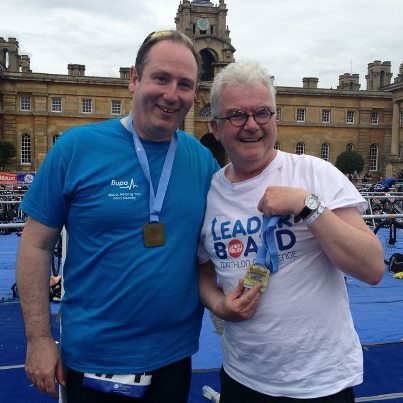 We were both part of the same team, The LeaderBoard, a motley collection of UK-based CEOs. And here’s the official video of the event. I appear, very briefly. But I bet you won’t spot me! Previous Post So, am I grown-up yet?